Who Will Be the Next British Prime Minister After David Cameron? Subject: Who Will Be the Next British Prime Minister After David Cameron? It's official: British Prime Minister David Cameron will step down by October after the United Kingdom's historic vote to leave the European Union yesterday. Cameron had urged his country to remain in the EU, but ultimately lost the vote to pro-Brexiters by 52% to 48%. It will take two to three years for the UK to fully exit the EU. And the next British prime minister succeeding David Cameron will likely lead the huge transition. There are two candidates in particular that have the best chances of becoming the next leader of the Conservative Party. Chatter: After David Cameron steps down in October, members of the British Parliament will hold a contest for who will replace him. The candidates who wish to run for PM must apply with Graham Brady, who is in charge of the backbench 1922 committee (a group of Conservative MPs). This committee of MPs will eventually whittle down the selection to just two candidates. Then Conservative Party members across the UK will vote on their favorite of the two. Johnson is an obvious favorite among Conservative PMs. The eccentric journalist-turned-politician staked his career on Brexit, knowing that leaving the EU would help a figure from the "exit" camp become the next leader of the Conservative Party, according to The Independent. 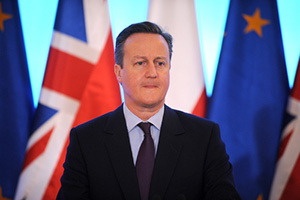 He is one of the most well-known and popular candidates among British Conservatives. A March 31 poll put Johnson ahead of his next closest rival (who we'll discuss in just a moment) by 22%, according to The Week. While Johnson is popular among the members of his party (especially among the Tory grassroots), many are concerned that he hasn't built enough support in the British Parliament, according to The Financial Times. Since many in the Conservative Party wanted to stay in the EU, Johnson will have to rebuild bridges that he mostly bulldozed while championing the Brexit movement. This next choice for British prime minster could be Johnson's foil. She has much more political experience than he does. May is most Conservative MP's second choice for the next British prime minister. She's trailing Johnson, however, by 22% in the polls, according to The Week. Still, she has a wealth of experience (and MP support) on her side. She's the longest-serving Home Secretary in a century. And while May doesn't have the star power of Johnson, she has won many admirers in her party by serving in a steadfast and competent manner, according to The Independent. One major thing working against May is that she backed the Remain camp, although she didn't actively campaign for her side like Johnson did. That will make it difficult for the British people to see her as the figurehead of the transition out of the EU. May is already building her staff for the bid to become the British prime minister, according to The Independent. This will likely become a heated competition between her and Johnson. Who do you think the next British prime minister will be? Let us know on Facebook or Twitter. I would put my money on Michael Gove as the best choice; but of course he's a Scot, so if Scotland has another Referendum, he might no longer be eligible.